A home renovation can be an exciting time. Thinking about your new space, putting together inspiration boards, and working on new designs bring an enjoyable change of pace from the regular routine. However, anyone who has taken on a renovation will tell you that it will temporarily disrupt your life. And, the more thought you can give to the project ahead of time, the better. 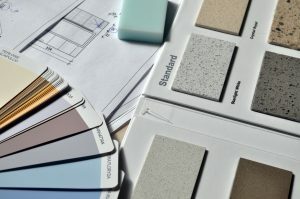 Home renovations vary depending on how many rooms are being redone. Many people have a spare room in their home that they just want to re-purpose. They envision a home gym, an office, or a library in place of an unused space full of boxes. One-room projects are naturally not as challenging as a kitchen redo or a full-home renovation. While bigger projects can have a wonderfully positive impact on lifestyle, and they should be looked forward to, they are not to be taken lightly. Regardless of the size of the project, there is the same obstacle to face at the beginning. What do you do with your stuff in the meantime? This is where we come in. A storage unit space can do wonders for your peace of mind through a renovation project. Having somewhere secure to keep your belongings, out of the way and out of mind, will allow you to focus on your work and family commitments and any contributions you may be adding to the project. Our customers have found that a storage unit is ideal for during a renovation for one other important reason: construction dust. This inevitable result of any construction project can wreak havoc on valuable furniture, fabrics, and electronics. Even with a great contractor and a conscientious crew (and even if the renovator is you), there will always be dust. Decide early whether to stay or go: A full home renovation project may require alternative lodgings for some of the time. Smaller projects may not. If you stay, we recommend setting up a “replacement” space for the family to still do the things they would normally be doing in the space to be under construction. A bedroom upstairs may need to become the “TV Room” or a corner of the downstairs playroom may need to be designated as a “Temporary Kitchenette,” complete with mini fridge and microwave, for the duration. It is also recommended that you make sure there is a quiet space for anyone who needs to get away from the construction and focus on work or rest. Inventory for storage: It’s important to have a rough idea of how much you will need to store and what items will go. 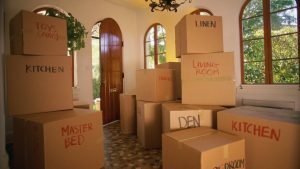 Going through the space to document your belongings according to category or location will help you decide on the size and type of storage unit you will need. Measurements may be helpful as well. And, if your project will go through any extreme seasonal changes at the peak of summer or winter, we recommend climate-controlled storage for all electronics (or appliances with electronic components). These do not fare well in extreme heat or cold. Kitchen Items: Glassware should be wrapped in bubble wrap and stored in appropriate containers, with extra padding to make sure shifting in the box is minimal. Appliances should be thoroughly defrosted and cleaned, with any cords properly coiled and tied for safety. We recommend climate-controlled storage and bubble wrap on the appliances for extra precaution as well. Bedrooms: Mattresses should be covered and protected during storage. Beds should be disassembled and the headboards protected by cardboard or bubble wrap. Mirrors and other wall hangings should be protected by cardboard and stored upright. Bed linens, curtains, small rugs, and clothes should be stored in plastic containers and labeled carefully. Living/Family Rooms: TVs and other expensive electronics should be wrapped in bubble wrap, with cardboard guarding the screens, in a climate-controlled storage unit. Large furniture items should be stored or stacked with care to avoid toppling and fabrics should be wrapped in plastic. Large area rugs should be rolled, never folded, for storage. Making use of a self-storage facility during a renovation can eliminate clutter in your home and in your mind. Contact us to reserve a storage space for your next home renovation. 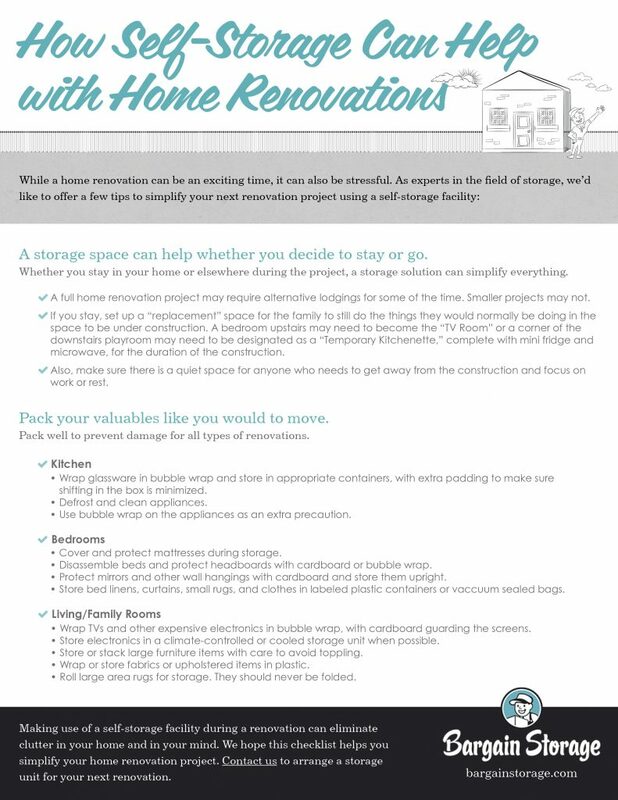 Download the checklist for more information on how storage units can help with home renovations!